Characteristic promontory located near the Chiusa della Valsassina and the small village of Baiedo, the Rocca is characterized by a set of small plates and spurts of excellent rock dispersed by the vegetation, while on its top there are the ancient ruins of a castle that, with its remains of the Tower on the nearby Corna del Biscia (Sasso di Introbio), historically represented an impassable armed barrier; for those who climb the streets that reach the top of the wall it is advisable to visit the ruins of the ruins. 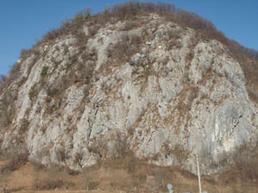 The itineraries that run through the structures of the Rocca are generally of low difficulty and climb well-clad plaques characterized by deep erosions and solid emerging granules. The rock is generally good or excellent, even if the vegetation, on the gaps in the streets, is definitely abundant and annoying. Furthermore, due to a landslide occurred in the winter of 1998, recent reclamation works have been carried out, fixing large containment nets to the wall that have included, in some cases, a climbing wall. The wall is divided into three sectors: left, central and right. Currently the streets in the left sector are inaccessible, because their departure is in the private field with fence and signs of non-access. Also here, as for most of the structures of the Chiusa della Valsassina, the valorizers were Don Agostino Butturini and the Condor group that, from the 70s, opened a series of beautiful, very repeated routes which have now become the classics of the area. More recently, the Alpine Guides have closed some routes, continuing and still taking care of the maintenance of the itineraries. But it is still the Condor group and Don Agostino who are carrying out the most significant works: in fact, after a massive work of cleaning and construction of the accesses, they have resumed their old ways, arranging them, replacing the riveting and finding the space also for new itineraries. 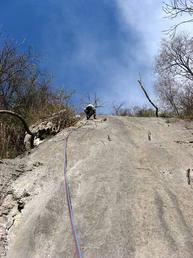 Today the base of the Rocca can be considered as an interesting cliff to itself, with some well-bolted routes and always excellent rock. The nailing is mixed, generally good to fix and resined on almost all the streets; it is anyway advised to bring at least a series of nut, useful for some historical itinerary not requested. The routes at the base of the wall (name at the base) are instead perfectly protected to fix, the helmet is however essential for all the routes. Enzo Nogara, a mountain guide, is currently in progress, assisted by Laura Rusconi and Alfredo Binda: now re-equipped the streets Tuono, Folletto, Navjo and partially Necropolis and Solitudine. The descent is done in double on the streets; for the Via Solitudine, however, it takes place from the path that descends on the north side behind the Rocca: attention in the winter for the possible presence of frozen sections. Access: From Lecco, go up to Valsassina, where you follow the signs for Introbio until you reach the bridge over the Pioverna stream just before the town of Introbio. Without crossing the bridge you park on the left side of the provincial road, just at the base of the Rocca; shared parking with the Valsassinese cycle track. On foot you go along the road at the base of the Rocca and, by tracks, you reach the various sectors 5 minutes from the parking lot.